The DLEX2501V is one dryer by LG that has useful features to users, making clothes drying more convenient. For example, there’s the LG-trademark EasyIron feature leaves all dried items free of too many creases and wrinkles. More savings on energy is ensured with the use of the Sensor Dry System that automatically adjusts time and temperature depending on the load. Lastly, with the model’s 9 drying programs, there is surely one program to customize dry any item, reassuring you that there will be no damaged items. The End of Cycle Beeper and Drum Light give the user convenience, from having a clear view of whatís going on inside the dryer without having to open the door to being informed that a cycle has already ended. The FlowSense technology in the dryer allow a more efficient manner of drying, as with the Wrinkle Care Option, which users can employed to get dried items without having to worry too much about ironing. The machineís interior also has a TrueSteam Generator , a trademark feature of LG machines that allows items being dried to have steam applied to them , lessening the severity of the drying process. The Anti Bacterial feature gives users thoroughly clean, bacteria-free dried laundry items. The 5 temperature levels built-in the machine, High; Medium High; Medium, Low; and Ultra Low make sure that there are drying temperatures to fit every kind of load you will be putting into it. The control panel on the machineís top portion is equipped with a dual LED display, providing the user all the information needed to be updated on whatís going on with the machine, like the remaining time display and status indicators. The reversible door of the model makes it a breeze for any user to operate the machine as a whole, as there would be no more need to exert too much effort in opening and closing it. 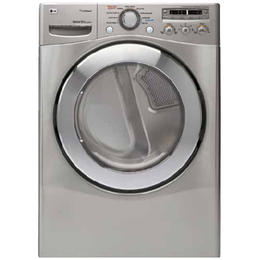 The steel-colored exterior gives the dryer more shine and sleekness. The additional features of this dryer make it very convenient for users. A particular beneficial feature for households with children is the Child Lock which keeps children safe from accidentally using the dryer. The adjustable dry times feature make it more convenient for users to really extend or shorten dry times by the minute, not chunks of 15 minute increments or decrements. Since the model is a front-load dryer, with its door in front, the top portion is available for stacking, or it can be used as a countertop where other things can be placed or stored. For a dryer that has so many features, some users may find that they would need to learn how to use them, instead of enjoying them ASAP. pre-determined dry times of 60 min., 50 min., 40 min., 30 min.,20 min.